Josh Dion: "You’re constantly learning about the choices you make, how to make an impact and how to listen to others"
The internet is awash with drumming videos, all vying for our attention and ‘likes’. But it takes something genuinely special to stand out amongst the online clutter. For many, the last time lightning struck was back in 2015, when a soulful live performance from Seville’s Tam Tam drum festival began circulating. The drummer was one-man machine Josh Dion and the song was A Vision Complete. The track was underpinned by a filthy 4/4 groove. Normal enough, but Josh was playing the drums exclusively with his left hand, while the right danced across the keys of a bright yellow synth perched between his bass drum and floor tom. In a final twist, Josh had a staggering singing voice too. It was a confounding display of dexterity, balance and, above all, feel. Quite rightly, Josh’s career has been on an upwards swing ever since. A Vision Complete was lifted from Josh’s funky, psychedelic duo Paris_Monster, an act he formed years prior with long-time creative partner Geoff Kraly. In addition to a catalogue of great songs, the band thrives on improvisation and free expression. There’s an album on the way and the band has just announced a UK tour in September. Despite the viral video, Josh’s story is far from an overnight success. Following a musically rich childhood, Josh began to really mould his musical approach in his late teens. Moving to New York, he discovered jazz and cut his drumming teeth gigging constantly around town. Was there a lot of music in the home when you were growing up? “Yes, very much so. My dad is a drummer and my older brother taught me a lot about music when I was young. Growing up, it was all about listening to records, asking questions and playing drums. I had a drumset my whole childhood, but no lessons really. You moved to New York. Is that where you fully developed as an artist? “Yes. When I was about 17 I was getting into the jazz scene. I bought a small jazz kit with an 18" bass drum and I was checking out Philly Joe Jones, Max Roach, Art Blakey, Elvin, Tony. "I was hanging with a whole crew of guys. They taught me standards. They taught me how to hear the chords, how to understand what the melody is, how to play melodically over and within that. The blues, the church and classic rock, that’s my roots. But jazz was something that I discovered myself. When did it evolve into developing your own thing, your own music? “I was touring with a band called Ulu, around 2003. It was my first touring experience. It was young guys who wanted to freak out and jam, play in odd time signatures. They already had songs, kinda like a Herbie Hancock Headhunters thing. It incorporated the funk stuff, but it was open, like anything could happen. That was a good experience. At what point did playing keys come into the frame? “When I was about 10 years old I had an amazing music teacher in my public school who taught me how to play keys. I’m so glad because she saw something in me. I was a hotshot drummer and she completed the spectrum for me. I could kind of play, especially with my right hand. It seems that improvisation is a key element of Paris_Monster? “It’s cool because the keyboard completes my set-up. I can kinda go in any direction. I could just play drums, I could play songs, I could improvise, I could sing, I could play keys or do the whole thing. I think that there’s so much to be explored with it. Have you always felt comfortable improvising or is it a skill you’ve had to develop? “You’re constantly learning about the choices you make, how to make an impact and how to listen to others. Sometimes we think that improvisation has to be this thing that’s beyond anything, but really it can be anything or it could be nothing. It’s about finding something and committing to it. It can be conceptual. "That’s the thing about music that’s so beautiful. You could take somebody on a journey, you could write a whole tune right there. I just think the more you work on it and the more you put yourself in that situation, the more comfortable you get. “Within Paris_Monster, even though there are songs, I feel the need to constantly be dancing. It could go anywhere. If it’s verse two and I want to go to the very top of the keyboard and play one note and I want the beat to be turned around, that’s my idea and, boom! I’m doing it. Did your unique drums/keys/vocals set-up take time to master? “It took some time. I had some really bad shows. With drums you’re hitting harder. It took me a while to learn how to touch the keyboard right with the drums. But I figured it out. Tempo-wise it really helps to work with a metronome and to feel the push and pull of what it is to do that. 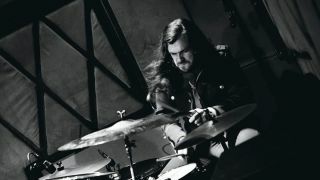 You often play drums with only your left hand and rhythmic parts on the keys with your right. Do you treat the synth like an extension of your kit? Groove seems to be at the root of your playing with Paris_Monster, too? Your drum sound is beautifully warm and open. Is there anything specific you do to achieve that? “[When I request gear for a show] I want two one-ply coated heads and a 20" bass drum with nothing in it. I don’t want a hole in the front if I can do anything about it. If I want to manipulate that sound I want to do it myself with a little blanket or something, but there’s something about feeling the full bottom of that bass drum - a fully functioning, ringing drum. Many people will have first seen you in the video for A Vision Complete live from the Tam Tam Drum Festival. What have been your personal highlights since that video blew up? “You know how people always recap on New Year’s Eve and they say, ‘It’s been great year’. I’ve never felt the need to do that, but I will say that last year I could have done that, because so many cool things happened. The Paris_Monster recorded a full-length album. I toured with Esperanza Spalding, which was inspiring improvisation-based music. "I played multiple amazing gigs on Monday nights in New York with the Jim Campilongo trio and I started to play the Wayne Krantz gig, which is something I always wanted to be a part of. Since Tam Tam it’s been a life change. "I don’t care about money, but it really comes down to the fact that when you do actually start making money doing the things that you undeniably love to do musically, you feel a certain freedom. 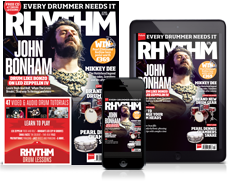 All-access interviews, in-depth gear reviews and world-class tuition with the UK's best-selling drum magazine.